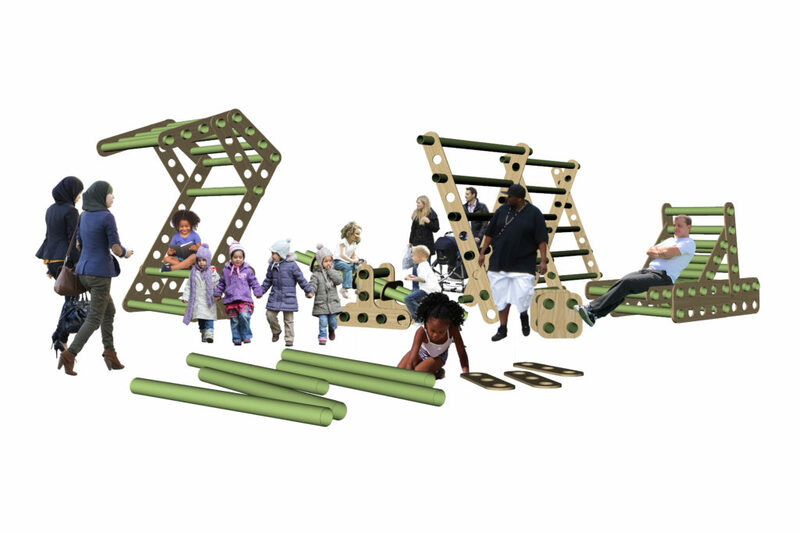 PULP: Obstacle is a pop-up playground made of plywood and reclaimed cardboard tubes. The installation was originally designed to be a standing wall, however children at Summer Solstice 2015 insisted it works better horizontal, and we had to admit they had a point. This installation was designed with Peter Kelly. Inspired by PULP: Obstacle and its ability to invite festival visitors to complete a half built structure, PULP: Make is a new art installation that aims to allow for pop-up architecture. Six 4×8′ plywood panels will be machine cut to different forms. These forms will have circular holes the size of cardboard tubes, allowing for easy connections. You are invited to join us and create a bench, sea saw, a table, and even a full size pavilion. Mikromaladang is a large scale communal sculptural couch that seeks to explore the notions of utilitarian and industrial designed objects, and in this case specifically couches. With the exhibition of this work being at outdoor summer festivals, this work plays up the outdoor elements in a playful manner alike to how furniture are often packaged and bungee-cord wrapped up during transportation and delivery. The title of the work, “Mikromaladang”, is a play on words from Cantonese and Greek origin which plays homage to industrial designers (in this case the two artist collaborators) where they would create a new word by combining various words to incorporate a larger meaning to describe their project. The assembled title contains fragments of meanings of being large, soft, hard, and small which alludes to the physicality of the actual work. 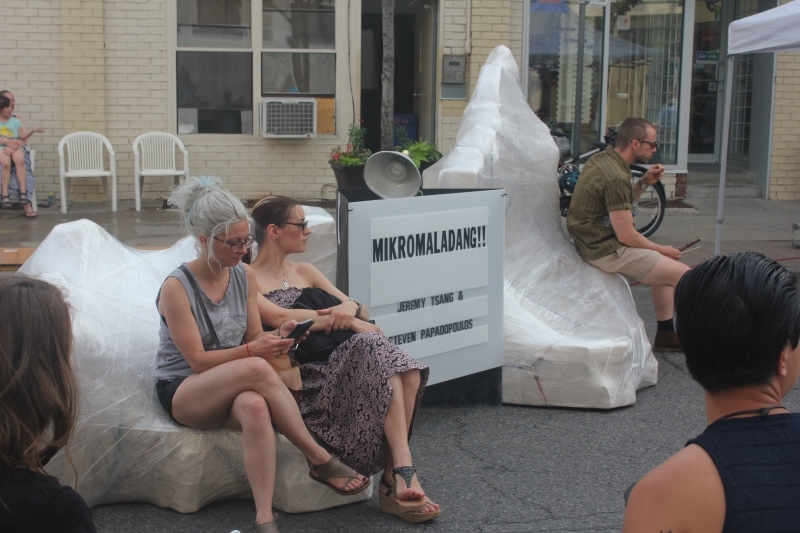 As part of the selection of PULP Reclaimed Art & Design Projects for this year’s street festivals across Toronto, Mikromaladang contains mainly reclaimed Etha-Foam from local mascot designers and makers in Toronto. Each piece of these foam materials (negative residual space) is informed by the original shapes and figures being craved by the mascoteers. This sculptural couch dramatizes its value and alludes to a grandiose designer furniture through being created to be oddly oversized and ostentatious in shapes and then being hidden underneath usual packaging cloth material, industrial plastic wrapped and accessorized with bright coloured bungee cords. Jeremy Tsang is an artist with a varied & cerebral practise based out of Toronto attempting to encapsulate the present day 21st century conditions and experiences. Tsang has exhibited across galleries in Canada, including St. Mary’s University Art Gallery (Halifax), Gallery 1313 (Toronto), to Latitude 53 (Edmonton). Steven Papadopoulos has a BFA from the Ontario College of Art & Design University in Drawing and painting and an MFA from The Glasgow School of Art. He has exhibited in an extensive amount of group shows and collaborations within Glasgow and Toronto. At the request of Larissa, our flamenco performer (see more information on the Performance and Activity pages), artist Ksenija Spasic took the challenge of creating a Spanish style caseta tent. 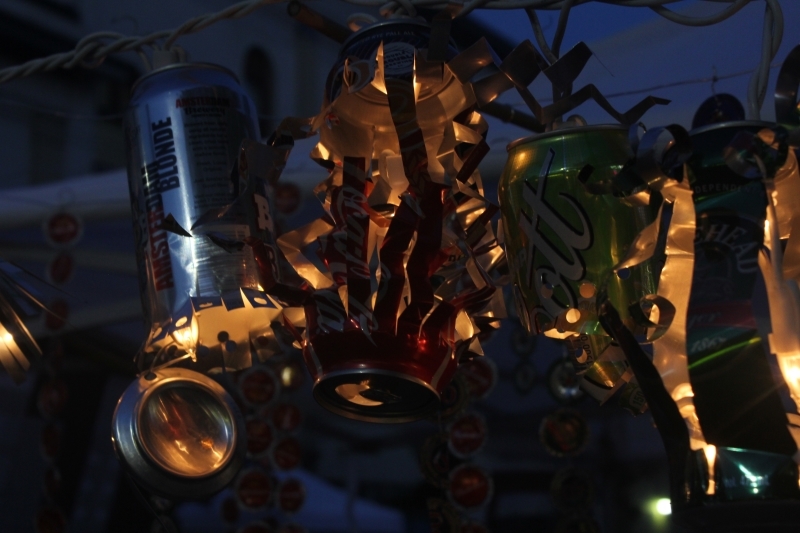 Colourful lanterns made of used pop cans will decorate Larissa’s tent and cast shadows as the sun goes down. In this installation by Venessa Heddle and Max Yuristy for the PULP Card Yard, translucent plastic recycling bags are molded into a playful and buoyant sculptural mass. Through a process of sealing the bags into air-tight containers, the artists have transformed the everyday recycling bag into ‘balloons’ that, when tethered together by high-strength magnets, take on unexpected shapes that move with the wind and welcome visitors into the Card Yard. Participants (especially those willing to crawl into small spaces!) 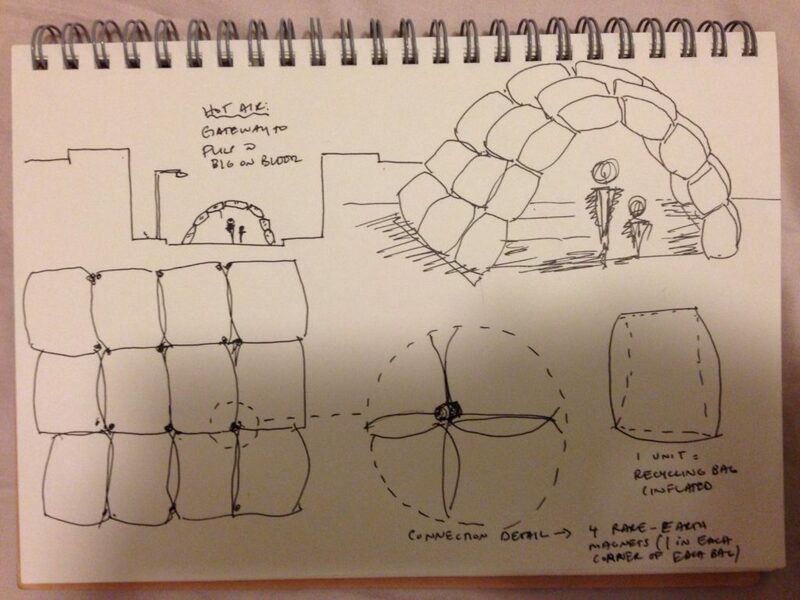 are invited to interact with Hot Air and take repose underneath it.